This entry was posted on 10th February, 2011 by Haxnicks. 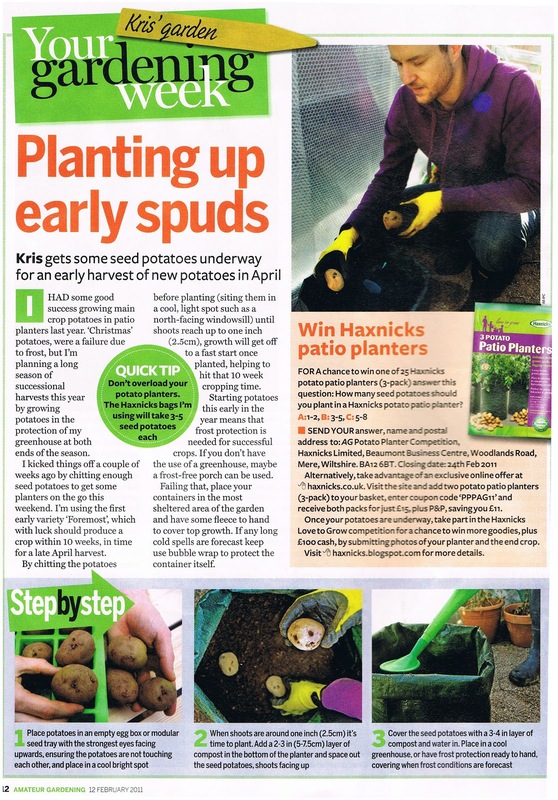 In Amateur Gardening this week, gardening editor Kris Collins wrote about how to get started with growing potatoes, explaining how to chit and how many potatoes to use in each planter. Before I spoke to him about the article, I had already decided to choose a certain variety known as 'Sharpe's Express', which I bought from my local garden centre (see pic below). Seed potatoes at Orchard Park in Gillingham, Dorset. The potatoes were described as being great for all manner of cooking methods and being disease resistant sounded perfect for me. These factors are obviously rather important as I'm the one who is running the Potato Planter Competition! The pressure is on, especially as the last time I grew potatoes in containers was when I was 10 years old - almost 2 decades ago now! Luckily for me, the beauty of growing potatoes in planters such as ours is that it is a much safer bet than sowing in rows - especially as you can move your crop into the greenhouse, or porch, if frost is on its way. Allowing your potatoes to 'chit' (I said 'chit'!) allows shoots to sprout from the 'eyes' of the potato and can speed things up, essential if you want to start growing early like I am. However, you can still plant potatoes straight into the bags without chitting. I placed my seed potatoes in egg boxes (see picture) and placed them on a shelf in the atrium between our office and warehouse - it's light, cool, but protected from frost. A few weeks have gone by, and the shoots are slowly emerging, but being the inquisitive yet impatient young chappie as I am, I emailed Kris to see if he could tell me anything about the potato variety I was about to plant out. "I grew Sharpe’s Express in one of your patio planters last year and got 2.5kg of potatoes – ended up being my best yield over all other varieties tried last year. Hope you have the same luck." Yes, I do have quite a smug look on my face, but my mother told me never to count my chickens before they've hatched (and she should know with all her bantam hens! ).